A monotonous grey landscape of rock, broken up here and there by a gleaming white chapel, is the first impression made on visitors as the boat draws into the harbour. But this gives them no idea of the beauty-spots waiting to be discovered inland, which together with the island's superb architecture, rank it among the jewels of the Aegean. The local traditional music and poetry are still alive in Sifnos. Tourist facilities on Sifnos are of a good standard and it is possible for the visitor to combine a lively night life with a peaceful island existence close to nature. An attractive drive from the port of` Kamares, a modern town with pottery workshops, brings us to the island's capital, Apolonia. Standing on three hillsides, with its typical Cycladic style of architecture, it is breathtakingly beautiful. It has an interesting folklore museum, while the churches of the greatest interest are those of Our Lady "Ouranofora" and St Sozon. Like that of the villages round about (Artemonas, Exambela, Kato Petali), the architecture of Apolonia is an odd assemblage in which walls, terraces, courtyards and alleyways form large cubes in a continuous complex, in total harmony with the natural environment. The sole exception to this is the old capital of Kastro, which remains an example of medieval town planning. A collection of Archaic and Hellenistic sculpture and of ceramics from the Geometric to the Byzantine period is on display in its Archaeological Museum. Picturesque windmills surrender their sails to the vagaries of the wind, while no fewer than 365 churches and chapels sprout all over the island like white mushrooms from the grey carpet of the island's terrain. The monasteries of Sifnos, such as that of St Symeon, of Ai-Lias, the Vrissi monastery with an interesting little Byzantine museum and that of Our Lady "Hryssopigi", the patron saint of the island, are held in high esteem. The strong local colour of the mountainous island with its strips of coastal plain is further heightened by its picturesque fairs and festivals. The first inhabitants of Sifnos were the Kares and the Phoenix. The Iones came later. 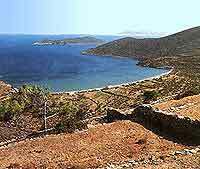 The island was famous in ancient times for the wealth which came from its gold and silver mines and the quarries of Sifnos stone. It enjoyed great prosperity in Classical times, as can be seen from its Treasury, dedicated to Apollo at Delphi. There are clean and attractive beaches at Kamares, Fares and Platis Gialos as well as quieter and lesser-known ones, such as those at Hersonissos, Vroulidia, and Fikiada Fassolou. In Apollonia you can find clubs, bars and taverns with live greek music. Bars can be also found in Platis Gialos. Windsurfing.You can rent surfboards on the island.